It was hard to know how much to share with Randy because I felt like he was a friend first. I came to learn I could completely trust him. I can’t tell you how many times we just chatted for hours, face-to-face or over the phone, about everything and anything. So often he was simply a sympathetic ear that I could vent to, as opposed to a sports reporter looking for a dirty scoop. Although we first connected around his passion for sport, including rowing, we really connected around our families. I think we shared more stories about our daughters over the last 8 years than we did about sport. When I called a colleague today at the COC she said it perfectly: “Although I’ve never met Randy’s daughter I feel like I’ve known her for years.” That’s exactly how I feel. We often swapped children’s book titles – we knew each other would appreciate hearing about the victories, small and large, of our girls. Randy often provided me insight into what to expect in the years and months to come as his daughter is a few years older than mine. No matter what the ‘heads up’ was that he provided, his daughter was as close to perfection as he could imagine. You could hear his love for her in the words he chose when he shared stories – but more than that you could see it in the way his face lit up and in his body language. I will miss Randy. I will miss not seeing him each time I’m in Toronto. I will miss not sharing my final ‘Olympic-experience’ with him this summer in London. I know that I speak for so many Canadian Olympic athletes when I say he was one-of-a-kind, trust-worthy and his character was of the highest integrity. But most importantly, Randy was a friend. My most sincere and heartfelt thoughts and prayers are with his wife and daughter. It’s crazy to think about how I’d stay in touch with family 10 or 15 years ago when I went on rowing trips. I remember making collect calls to my parents from the pay phone at the rowing course in Munich. I used to carry the Canadian international phone numbers in my wallet so I could always reach a Canadian operator from anywhere in the world. Now all I need is an internet connection. I can talk with my daughter for as long as I want on Skype – and it’s like I’m in the room with her! I’ve seen my son walking, playing and laughing while I talk with Rachel. I don’t know how I’d survive a long trip like this without the internet. Connection’s a bit dodgy here; I have to go to the coffee shop next door to get good internet – and then it’s not cheap – but it gets me back to Victoria with my family for those 30 minutes…and you can’t put a price on being with your family. The last time that I was on this course would have been at the Pac-10 Conference Championships racing for Bob Ernst at UW in 2001. Fast forward to today – I just rigged and rowed my single, and at 4 PM the sun was out and I was wearing just my uni suit. I love the warm weather. Part of my survival for being involved in a specific sport at such an intense level has always been to use my time away from the lake to get some healthy distance. I traveled here today with Malcolm Howard from the men’s eight in 2008 and Mike Wilkinson, a newer guy to the team. We talked about rowing for hours. We had a 4 hour lay over in San Francisco that was gobbled up by our story telling. There was something therapeutic, even cathartic about talking through past events with one of the guys who witnessed or experienced them with me. Although I am not going to give up my sacred separation from rowing altogether, I do think that I want to let a bit more rowing into that space. We’ll see how the balance happens. It goes in the face of the ‘starving athlete’ image to disclose that Rachel and I have taken the kids to Oahu – especially to the stranger who was kind enough to offer to build me a bike. But there is logic and savings in taking this trip now. Rachel somehow managed to ‘swap’ our suite this past summer with a family she found on Craig’s List (different Craig). The family is from Oahu and wanted to swap with someone in Victoria. Their kids went to Camp Thunderbird last summer. Great family! They came and had a fun adventure in Victoria. It took us 5 months, but now we are finally on our half of the swap! We were going to go in November but we didn’t get Bowen’s birth certificate in time, so we couldn’t get his passport either. All that said, we are in Hawai’i now! The last time I was here was 10 years and 1 month ago with Morgan Crooks. We were on our way back from an Olympic test event in Sydney. They ran a mini regatta exactly a year out from the Olympics. As for this trip, Bowen flew for free (and did a great job on the plane), the accommodation is free and we have a kitchen to prepare all our meals. And besides, this is the vacation to end all vacations – at least for 2 1/2 years. Once I start rowing in March there are no vacations until after London 2012. We arrived two days ago. The family we swapped with lives in Kailua on the east shore of Oahu. The first thing we did was hit the beach! 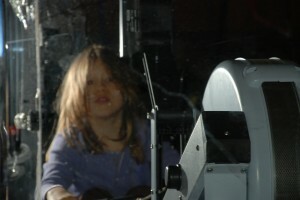 One of the family’s daughters, 9 year old Nicole, walked down with us as our guide. 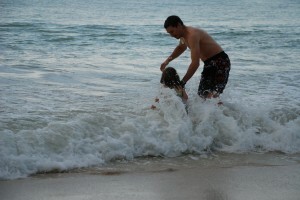 Mira and I waved jumped until her lips turned blue – Rachel just laughed as we got pummeled by wave after wave. It was so much fun; one of those moments that will live in all our memories. It was so special that Mira and I rolled out of bed yesterday morning and headed straight back to the same beach and Rachel and Mira are there now! Yesterday we also headed to Pearl Harbour – December 7th being the 68th anniversary of the Japanese bombing (1941). 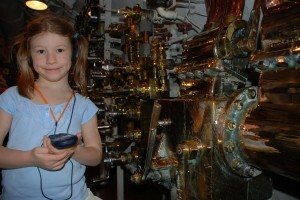 Mira and I went aboard the USS (submarine) Bowfin at the memorial site. It was a beautiful monument, but Mira was a bit insecure. We hurried through the inside of the sub and spent lots of time on the deck. Last night I went to the local Blockbuster looking for the Hollywood movie Pearl Harbour. Rachel and I thought we could watch it after the kids were asleep. I should have guessed that there would be some cultural aversion to the Ben Affleck Hollywood love-story version of that fateful day when so many people lost their lives. I thought about the relative proximity of Pearl Harbour to where we are staying – and it would be as if the attack happened in Sydney (BC) if you live in Victoria (BC). Needless to say: they don’t carry the movie – good for them. We have another 4 days here in paradise. Honestly – it was completely unprovoked. It all started when Bowen was born. You see, I thought I’d train with the national team on Elk Lake in the mornings for their first row. You know, quietly slip out of the house at 7 AM and then be in the office by 9:30 for an efficient, high energy, 7-hour work day. I’d be back home by 5:15 PM for a relaxing night with my family. Well, it kind of worked – for two weeks. By ‘kind of’ I mean I was just hanging on. I was getting 3 or 4 hours of sleep each night, I was the slowest single on the lake and my high energy days at the office turned out to be more like a 7-hour marathon of trying to stay awake. Oh, and by the time I got home each night I was exhausted and would quickly fall asleep reading to Mira by 8 PM. My plan has always been to rejoin the national team full time in March of 2010. If I am in shape leading up to March then I figure I have an outside shot at being fast enough to make a world cup boat. But I definitely should be able to be race ready by the time the worlds roll around in November, 2010. I set up the erg yesterday. As soon as I set it up Mira wanted a turn. Not to curb her enthusiasm I said okay. She hopped on and had surprisingly natural technique. She drove her little 5 year-old legs, swung her little 5 year-old body and pulled her short little 5 year-old arms in. More amazingly she had the recovery sequence too. Her little arms shot out, she swung her little body over and then she slid up the slide. MY JAW DROPPED. 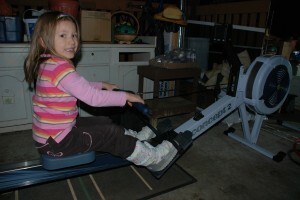 Not sure what was going on – I had to pry her off the erg to go to family supper at my Grannie’s house. In fact, I had to promise her another turn on the machine later when we got home. Sure enough when we pulled into the carport she remembered and was fired up to get back on the machine. She had a quick turn, but it was past her bedtime, so again, I convinced her to go inside by promising her another turn in the morning. This morning when 6 AM rolled around I was so excited to get to workout at home. I woke up and jumped out of bed with excitement – laughing, knowing where Mira got her enthusiasm from. I got locked in and pulled a solid 45 minutes at 1:49/1:50 splits listening to Big Wreck. Shortly after my workout Mira woke up. Rubbing her eyes she walked into my bedroom asking her typical “Daddy, will you play with me?”, but then cut herself off and gasped – “Erg? 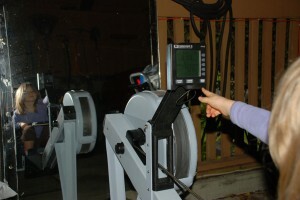 Can I go erg?” I burst out laughing and we went back outside. We went out and I set her up for a 10 minute workout, the first 5 minutes was all coaching. She loved it and felt great heading back inside. Then when I got home from work tonight she was there, waiting for me again. “Daddy, can I erg now, please?” I couldn’t say no. This time I set her monitor up for 500 metres. A good distance for a 5 year-old and a way for me to teach her about goal setting. 500 M in 4:06.1! We’ll see if she can beat it tomorrow – if she wants to! 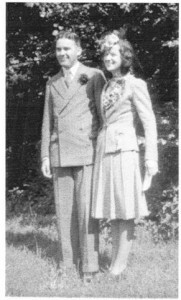 My grandparents got married in England during the war. They were married on May 20th, 1942. Although there were no reported raids on London, that day marked the Japanese raid on Darwin Australia; it was also the day the first African American recruits were permitted to serve in the US Navy. Bottom line, it was war time. There was no time or money for white dresses and rich buffets. Grannie saved her rations for months to buy the dress she wore – a practical dress that could be regularly used. But traditions, especially those that cost nothing, must have been the hardest to let go of. Running out of a church with rice flying and the bells tolling is an image we can all picture, especially in England. Not during the war. Although Grannie loved the sound of church bells ringing, during the war they only tolled to mark a German bombing raid. Upon the tolling of the bells a community would execute their blackout procedures; cover their windows and turn out their lights. Over time the sound of church bells no longer symbolized joy – they instilled fear. But not for Grannie, and not for her romantic groom. Granddad surprised her one night following their wedding; he grabbed Grannie and whisked her into the closet under the stairs. Her curiosity perked as he proceeded to stuff towels under the door and pillows in any cracks to block out all the light that was slipping in. Then, in total darkness he lit a single candle, uncovering for the first time the record player he had previously set up under the stairs. Confident that the neighbours could not hear them, he flicked the switch and an old record entitled “The Church Bells of England” started to slowly pick up speed. Cuddling under their stairs with only the light from that single candle, my grandparents celebrated their wedding listening to all the church bells of England as loudly as the record player could go. What a great story. Thanks Grannie. It is with great excitement that I get to announce the arrival of my son, Bowen Christopher John Calder. 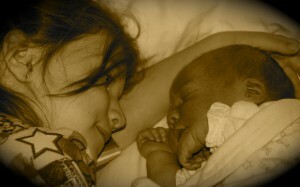 Rachel is recovering from the home birth, and little Bowen is a cute little guy. Both are healthy and well. More blog tomorrow about Bowen if time allows. 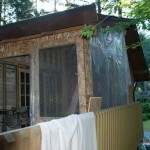 On Sunday morning I dropped the girls off at the airport and headed home for a solid day’s work on the home reno. An hour or so in my motivation began to wane. I found the Tragically Hip Fully Completely album and cranked it on repeat. After that I had to stop working at 8:20 PM afraid the neighbours might call the cops. I hope to make a ton of headway while the girls are out of town. I can’t wait to be finished. UPDATE: Two of my windows arrived via delivery van this morning. I can hardly wait to get them installed tonight. Strange are the things that excite this 31-year-old. Rachel and Mira went to the mainland for a birthday party yesterday and I got to stay home alone and build things with my power tools. 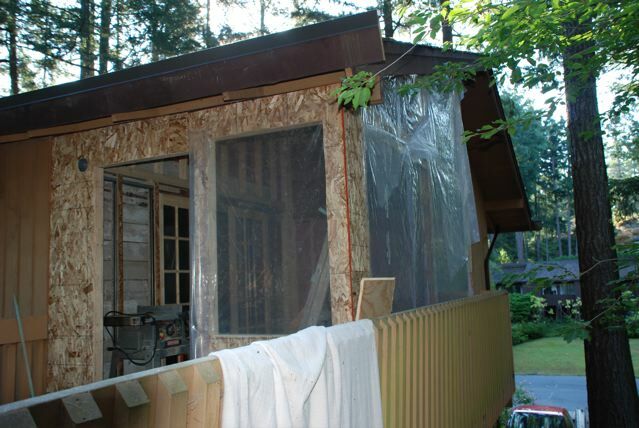 I am renovating the office/guest room now that we have the new roof on. 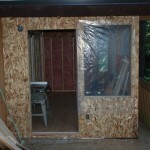 I have to finish this room before I can start the nursery. Yes – Junior’s due date is September 14. People, the clock is ticking. It is awesome to build something with my own hands again. The Tillicum house was fun at first because lifting it and putting in a suite was getting my little family ahead financially. It got old into the third year though. 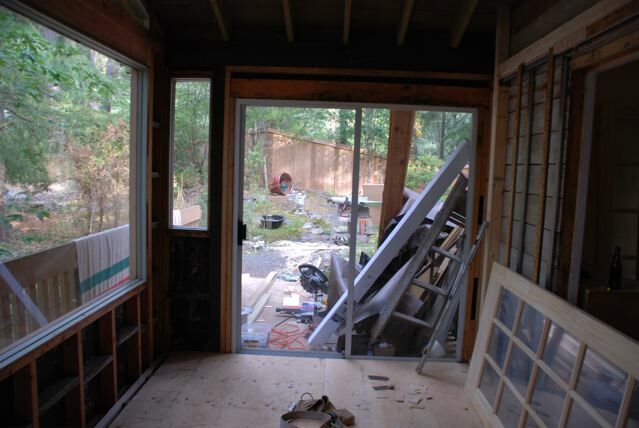 By the fourth year renovations nearly put me in my grave. I think I also asked a favour of every one of my friends and family, especially the strong ones. I am trying to pay them all back one at a time. 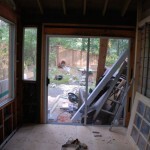 We can see ourselves in this house for a long time. Maybe even past our children’s high school graduation. 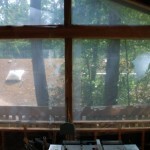 So the projects I work on here have to be Perfect – or as close to it as I can. 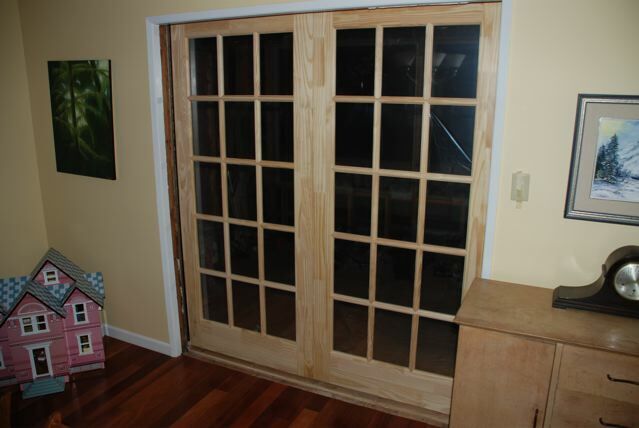 Yesterday I framed and hung a double pocket door. Somehow I managed to electrocute myself doing it, go figure. 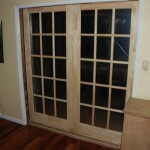 The doors meet up perfectly and look great. It only took ten hours to accomplish. 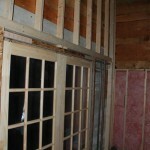 I have two of the walls framed and ready for the new LowE windows I ordered. 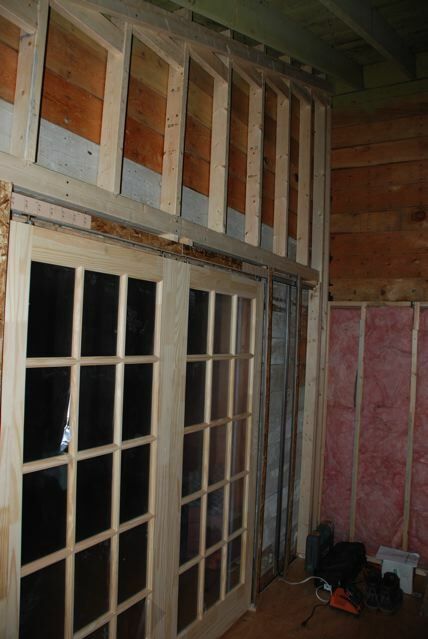 They should arrive in a week or two, by then I should have the other two walls ready. 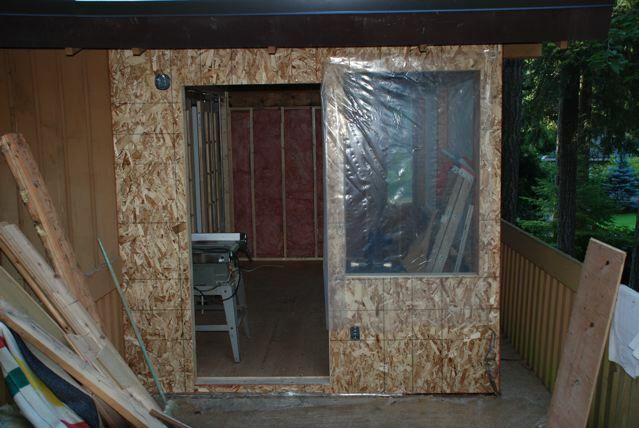 You never know, I might just have the room ready by the time my dad visits in August…and the nursery might be ready by September. This past Sunday was Father’s Day, but it was also National Aboriginal Day here in Canada. A year ago Sunday, Prime Minister Steven Harper historically apologized to the survivors of Residential Schools in Canada – acknowledging the Government of Canada’s oppression of First Nations’ culture and families. In stark contrast, this Sunday I awoke to the sound of whispers coming from Mira’s room, interspersed with the crinkling of paper. My girls delivered my morning latte to me in bed with a special poem folded up and a “love-bug” piece of artwork from Mira. Blissfully we lounged until it was time to start our day. 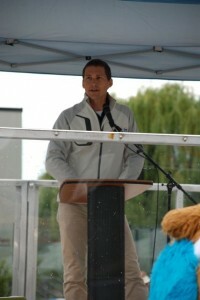 I had been invited to speak at a Act Now BC Road to 2010 activation event in Duncan, BC, that coincided with the ceremonial unveiling of a Spirit Pole. We had no idea the cultural experience we were about to witness. When I give talks I tell people about the importance of role models in my life. It took hundreds of people to lift me onto the Olympic stage. My message to kids is to have wild and crazy dreams, but to back them a solid plan. I’ll often point out the teachers and parents in the room as resources to them. In other words, I talk about community. This last Sunday, on the traditional territory of the Cowichan Tribes, Rachel, Mira and I witnessed the meaning of community in action. 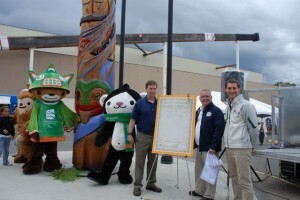 In front of a crowd of aboriginal and non-aboriginal people alike, the Chief, Council and Elders of the Cowichan Tribes unveiled a new Spirit Pole commemorating the 2008 North American Aboriginal Games. Special guests at the ceremony included the Duncan Mayor and Council and Minister Abbott, BC’s Minister of Aboriginal Relations and Reconciliation. Last August the Cowichan Valley was the sporting place to be – not Beijing after all. They played host to the North American Indigenous Games, boasting undisputedly that their games were the best games ever. But the Cowichan Tribes wanted to draw a larger community into the games, and they wanted to share their culture with other communities across BC and around the world, including non-aboriginal communities. Their torch relay turned into a touring collaboration Spirit Pole. Carey Newman was commissioned to be the master carver/artist of a cedar log from Stanley Park, which toured across BC for 13-weeks stopping in 51 different communities. Thousands of people from across BC shared in carving a bit of what has grown into the beautiful Spirit Pole on permanent display outside the Cowichan Aquatic Centre. The power of this project and the pride of the people involved were so clear to all present at the ceremony. Bearing witness of the event was humbling and left me wishing I had been involved, even just in a small way. There were leftover shavings from the pole in the crevasses of the trailer it traveled on. I was tempted to take one for prosperity but my reverence for the process gave me a sense of pride simply to witness the community’s achievement. To the people of the Cowichan Tribes, and specifically those involved in the creation of the Spirit Pole, you have accomplished something of cultural significance that will be shared with generations to come. Congratulations.